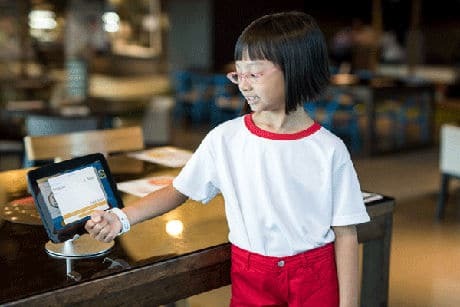 Singapore bank POSB has successfully completed the pilot test of a school contactless payments system that lets students make purchases in the canteen or bookstore and monitor their finances. The POSB Smart Buddy trial took place in two Singapore schools fitted with contactless terminals during the summer. Some 130 students from Anchor Green Primary School received a customised POSB watch, while 60 students from St Joseph’s Institution Junior tested a modified student concession card. An accompanying mobile app allowed parents to set their children’s daily spending limit and check their savings in real time, and provided the students with up-to-date balance information so they could monitor their remaining daily allowance. The watch also doubled as a fitness tracker, helping the children track their steps and calories burned for the day. “The most exciting part of POSB Smart Buddy is the level of enthusiasm and creativity it has sparked among the students,” says Jeremy Soo from POSB owner DBS Bank. “We had some young students present us with a long list of ideas for customising and improving the watch/card and the app. “POSB Smart Buddy is highly adaptable and has a great number of potential applications. Future iterations may include the ability to track diets, pay for transport charges, GPS tracking for security purposes, making the programme even more holistic. Island nations like Singapore, Iceland, Hong Kong, and Denmark seem to lead in the innovative use of technology. They make great test beds.